You could say that on that November 5th fixture, we were playing the part of Guy Fawkes. Steed Malbranque scored for us in that 1-3 defeat, in the away re-match, Marlet scored our only goal in a 4-1 defeat, these two defeats adding to the other 35 (call that 36 now) and we've only won 8. The Whites started with yet another shuffled defence for this highly anticipated meeting with the team from Woolwich, whoops, sorry that' should read North London. Slaviska having made two changes, Joe Bryan and Timothy Fousa-Mensah out, being replaced by Maxime Le Marchand and Cyrus Christie, otherwise the team lined up as at Goodison Park the previous week. The first half opened rather gently and looking to settle into a Close Encounter, little did we know that it would switch from sounding like a UFO Movie to a full-blown Horror Story. Once again, Luciano Vietto, who has shown much promise so far this season, tempered with many rude awakenings, started a nice move on two and a quarter minutes, advancing dangerously to the Arsenal goal and unleashing a great right foot shot which deflected through a defender’s legs, to be saved by the Arsenal Keeper Leno, I understad he is not related to Jay! In these early stages, it was all alertness from FFC and were looking punchy and adventurous, with good pressure, we were also stealing the ball a fair bit in the first 5 minutes, that makes a nice change. A close shave at our end was converted into a good move after around seven minutes, with a Vietto back heel nicely being taken by Mitrovic, in the middle of the field, he played a one-two with Luciano who advancing down the right wing and made inroads with a decent cross to an incoming Mitrovic who just outside right post, beat the Arsenal’s defence. 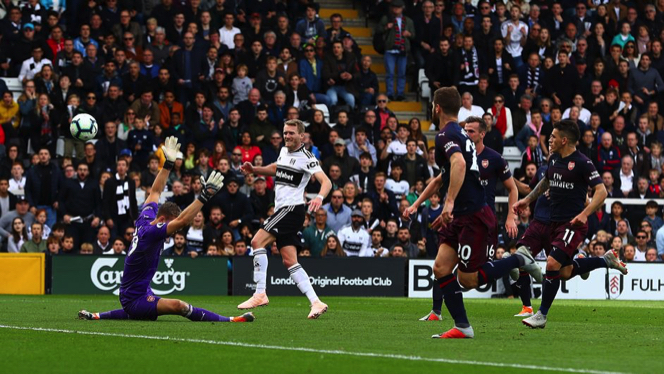 The shot was gratefully put out for a Fulham corner by Mustafi with Seri taking the corner, which reached Schürrle, his right footed volley cannonned back to André-Frank Zambo Anguisa whose poor control saw the ball ricochet back past him, he won the tackle but gifted the ball back to Arsenal for the usual customary Odoi intervention, which was correctly penalised by referee Paul Tierney. Vietto was again, in the thick of it in attack, constantly making good progress with forward runs and what with Ream looking composed at back, Le Marchand getting involved, it was looking quite promising. These first ten minutes had been an evenly matched game, our boys were hustling and closing down Arsenal when out of possession, Vietto was standing out for us and looking dangerous with every push forward. On 11 minutes, careless play by Anguissa lost the ball, costing us impetus on an attacking move, then he committed another error, I felt it for him, his is a nervous introduction to the Premier League. This has been a pattern so far this season, the newcomers are taking time to adjust, it’s a dangerous scenario. Zambo Anguissa then lost possession again and makes a ridiculous foul on 15 minutes, luckily in the head tennis following the free kick we win a free kick of our own. Mitro was fouled on sixteen minutes, winning a free kick off Montreal 30 yds out, not so sure it was a foul, to me it looked like a 50-50 challenge, both players had their feet high. Seri’s free kick reached the ever available Mitro whose volley misses by a fair distance, we really need to be scoring from these chances, that’s even more obvious given the slow progress we are making in building a reliable defensive line. With the clock reaching 19 mins Arsenal win acorner, in the build up to the kick being taken, there is the usual argy-bargy and joastling thatoccurs in every game played on this planet, and probably elsewhere, a little bit of handbags between Lacazette and Odoi, once the ball is played, Arsenal keep possession for far too long in our danger zone, eventually it fizzles out for a goal kick, whew!. Forbiddingly Arsenal were slowly dominating possession and encroaching into our half, looking dangerous, more and more. As we worked our way back and gained more possession and attacking, we still kept giving the ball away cheaply. Our tackling though had much improved and we began win more and more possession in this fashion. A fairly even game at the halfway stage of the first half, then slack defending allows Lacazette to score a soft goal, this was shocking defending yet again, Christie being nowhere to be seen, caught napping after an upfield soirée, Ream too was well beaten and befinning to look rather punch drunk, with no-one else moving, come back Fredericks and Targett! 0-1 on the half hour. Now It began to be all Arsenal, when Fulham make progress, the players were unable to impose themselves and play together, Christie is actually not playing as a right back, hopeless positioning, art this stage, he doesn’t appear to read the game, it seems as though he’s mentally a right winger and defending is his hobby, Arsenal should have scored two more in the last minutes. When we get the ball in good positions we waste it constantly, Vietto our still, far and away was our best player, Mitrovic had been getting nothing at all to work with. Over and over, we get a sniff then waste it Schürlle being a culprit on 42 minutes blazing over from 20 yards or so, then a rubbish Christie pass soars over Mitro as he makes a run on goal seconds later. Then miraculously an opening, after Odoi cuts out a dangerous Arsenal attack and concedes a throw on our left, Arsenal’s advantage is nullified and we win a goal kick, the ball progresses upfield and reaches our best player, Vietto whose lovely chip from the right is accepted by an advancing Schürlle in the 18 yard area, his flick beats the goalie and the entire Arsenal back line, Joy, 1-1. 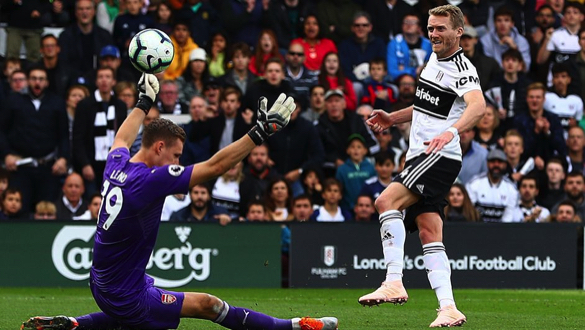 Anguisa made yet another dreadful challenge to concede a foul on 45 minutes, on this showing he looks like an accident waiting to happen, at least we finish the first 45 on equal terms, although Slav must be close to a breakdown looking at how his team are so fragile in defence. 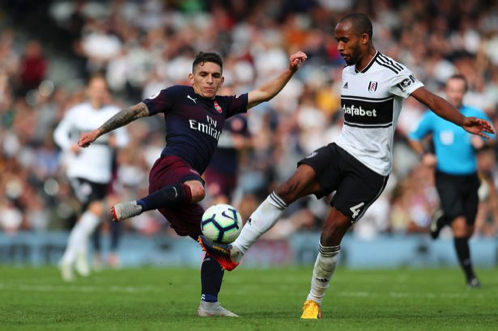 All in all a good outcome to what was a patchy opening 45 minutes from Fulham, the myriad combinations of players who are obviously not playing regularly together is proving to be high risk indeed. 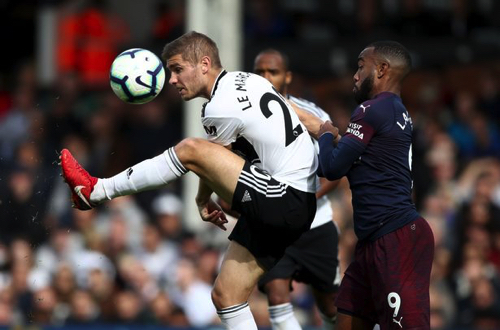 Also, the constant injuries that have kept our skipper sidelined over the past two seasons is also a major concern, he is desperately needed to settle the midfield and I’m hopeful the fact that he’s been out is not a portent for the future, we don’t want him to be a permanent ‘Sick Note’. Having said that, although the cutting edge of last season hasn’t returned, we do look promising going forward so we have something to look forward to in the run up to the half way point of the season. The second half kicked off and Fulham were now attacking the Hammersmith End so hoping to consolidate but straight away we’re losing the ball, and 2 and a half minutes in, Bettenelli makes a brilliant save to keep the score even, parrying a fierce drive, following an Arsenal attack cutting through us on our right wing, Owobi’s cross coming off Anguisa to Bellerin who struck the ball hard on target, we fortunately win a throw from the ensuing clearances. Considering we have not kept a clean sheet, Bets has been our most consistent performer in this encounterand then calamity on 49 minutes, ‘could go anywhere up and under’ from a midfield scrum landed at Lacazette’s feet, beating an out of sorts Reamand whacked a shot past Bettenelli whic would usually have for breakfast, he must have been asleep. 1-2 was a score line we didn’t want to see, at least it left plenty of time for us to get back into the game, we had enough in the powder keg to grab a couple of goals surely. On the restart we looked likely to keep up the pressure and Vietto again made inroads, eventually though play was stopped as Mitro controlled the ball in a good position, his push on a defender being penalised with a free kick. Ream, who wasn’t back his old self yet came off for Kamarra, at least this appeared to be an attacking change. 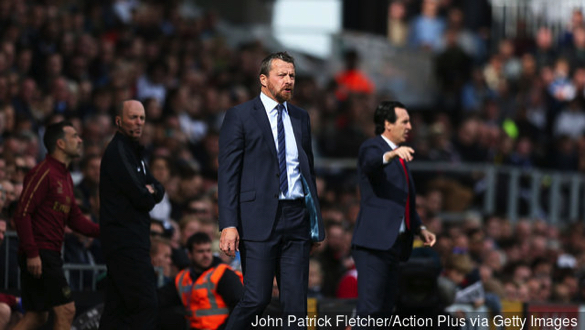 As the clock edged towards the hour, Fulham were on the attack more and more but the ball seems to be covered in soap and kept slipping away to the opposition, we then resorted to cheap fouls to attempt a recovery. The inevitable yellow card appeared, this one for. Vietto on 56 minutes, his tug on the tricky Lacazette being his undoing. On the sixty first minute, Anguisa came off for Kevin MacDonald. However, we still seem to be playing at Championship pace, every player stuck in a time warp, they all wanted too much time. Kamara was having a go and Vietto was still looking likely. Four minutes later, Seri wins a free kick after a 50-50, to no avail, we give the ball away and Arsenal fluke a succession of mishits and headers to get through our whole line, Ramsay flukes a back heel which catches everybody out, horrible! 0-3 and we look dreadful. I’ve since watched the TV and listening to the ‘Experts’ eulogizing over this move made me suspect a conspiracy theory story among the paid ‘pundit world’, they really do talk nonsense most of the time, it was a well taken goal but no way was it a brilliant piece of football in the build-up. The following ten minutes we dominated possession but were too often too inept for words, there was much to take heart from as we looked slick in possession but the waywardness of our passing constantly let us down, Vietto demonstrated this yet again on 76 minutes, lamely losing the ball on the goal line and conceding the advantage he’d imposed on the covering defender in the process. A minute later, there was more slack defending after Fulham had the ball at the other end, posession reached Arsenal’s Bellerin who crossed from our left to Aubameyan, Le Marchand who was almost velcroed to him, so close was his marking, was somehow easily bypassed with a swivel and a left foot shot that doesn’t miss, 1-4. And there were still another twelve minutes odd left to play! The wind (or should that be weak breeze?) had by now totally disappeared from our sails and we lresembled a derelift adrift and heading for the Goodwin Sands. It’s early days yet and this is still an experiment in team building with so many newcomers but no set team line-up still. 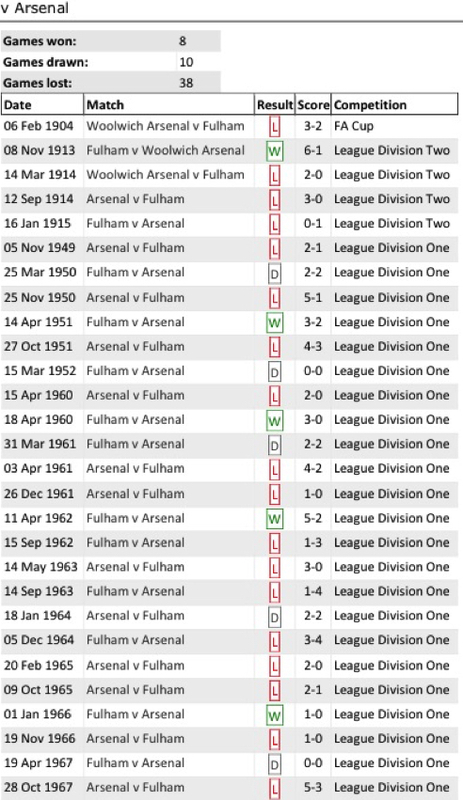 One has to observe that we do not have a positive conclusion yet and are rather looking too much like relegation material right now. Even Schürrle has been inconsistent, he’s rather slow, makes a couple of efforts, some very good but of which, the majority blaze over, he too often can’t win a tackle, then he disappears from the game, though in short, he’s not the only one. The last 15 minutes of this disappointing game are hardly worth reporting, we conceded again and really looked as though the final whistle was our only ambition, another inconsistent showing sprinkled with a few positives. On the positive front, there were many encouraging attacking moves in the first half particularly, Tim Ream, despite a few wobbles had a decent first forty five minutes, Vietto continues to bed in and Sessegnon has been quietly consistent. 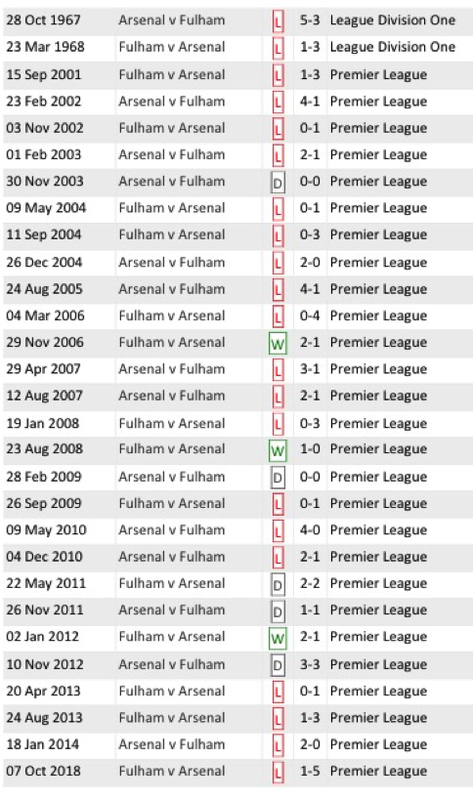 The grim statistics are: nil points from this game and not too many points for the players’ performances, a collective 4 out of 10, 8 games played and just 5 points on the table, seventeenth place and just 2 points from the bottom three, buckle up, this is going to be a bumpy flight for a while. Somehow it occurs to me that it beggars belief that we managed to spend £100,000,000 on transfers assembling this squad, only time will show the wiser. Looking at all of the newcomers, the much vaunted Seri has been somewhat average after a encouraging start to he season, Schürrle classy but hasn’t really imposed himself on any game yet, Vietto has looked very promising but lacks composure when near goal and all of the others, well, the jury is well and truly out.